Ever since Microsoft’s(s msft) Kinect came out, I’ve been wondering when the technology would get built into PCs. 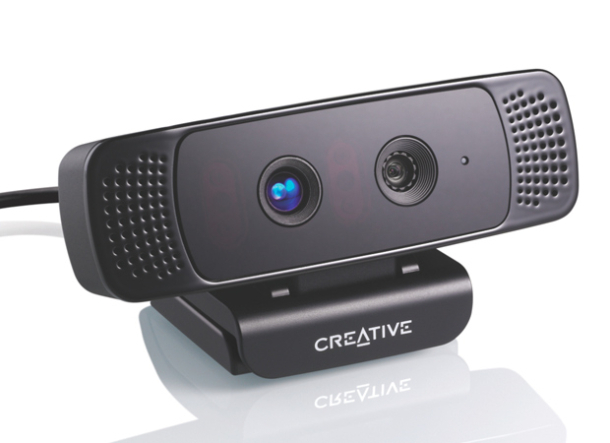 Yes, there is Kinect for Windows, but it’s a peripheral — I’m talking about having advanced motion detection capabilities in the webcam, as a bridge to exciting future user interfaces. Well, today I learned such technology is on its way, but not from Microsoft. No, it’s Intel(s intc) that the PC manufacturers are talking to, and it’s not Kinect that’s the base: it’s Intel’s perceptual computing technology. According to Paul Tapp, senior product manager in Intel’s perceptual computing division, manufacturers have “committed to doing it” in 2014 – “it” being the integration of an Intel-designed motion-detection system into their machines. And in the meanwhile, peripherals maker Creative put its $210 Senz3D, the first retail device to use the technology, up for preorder on Thursday. So what is Intel’s take on perceptual computing, and how is it different from Kinect? Nice for games, but also think of more serious uses, such as training surgeons. And, as my colleague Kevin Fitchard reported last month, the technology has much deeper implications and applications. The device’s infrared camera is sensitive enough to detect the tiny fluctuations in skin color that accompany each heartbeat, which allows it to pick up human emotion, to an extent. Depth perception allows facial recognition to be used as a password replacement (you can’t fool it with a photo) and there are videoconferencing uses too – the software can isolate the user’s face and either blank out the background or effectively green screen it (this part of the technology actually came from Personify). Tapp also suggested that – at some point down the line – the technology would be refined enough to enable low-cost 3D scanning. When I noted that the tech would generally be most useful in a device that’s not being carried, he shot back that 3D scanning and a mobile device would be highly complementary. Guess I should have remembered the successful Fuel3D Kickstarter project. Intel has had the software development kit for this out since last year (22,000 downloads thus far) and some developers have had early access to the Creative device, Tapp said, but the Senz3D is only becoming available to consumers on 25 September. If you want to try out Intel’s tech before it makes it into PCs next year, the Senz3D is probably the only way to go for now. It comes with a bundle of 10 pieces of software, from a password replacement service to games and video chat, and even if it takes a while for developers to come up with more, it should also make a decent (and very expensive) webcam. But hey – it could very well be the future. We’ll be highlighting new user interfaces at our RoadMap conference in November in San Francisco. UPDATE (6 Sept): This piece has been updated to reflect the contribution of Personify to the technology in question.